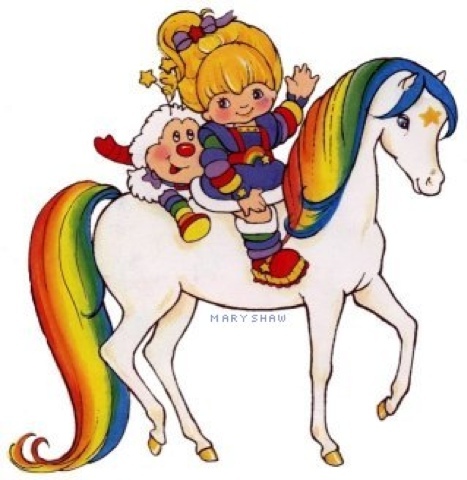 Starlite was Rainbow's faithful companion, not quite a pegasus as he had no wings but he could fly nonetheless thanks to Rainbow's magic. And that's who this beautiful polish is made for. A milky white base that was easily layered to gain opacity with red, orange, yellow, green and blue glitters. Stunning!! Murky Dismal was a bad guy along with his henchman Lurky (who I actually thought was quite sweet), he preferred doom and gloom to the fun and sunshine that Rainbow and the Colour Kids (and the Sprite's can't forget those little guys) brought to the world. He was always trying to rid the world of colour but thankfully he never succeeded. A milky mint coloured base with black and white glitter suspended in it. Again easily built up to perfect opacity. Both these polishes have a lovely crelly like formula and I feel they represent both characters perfectly! !